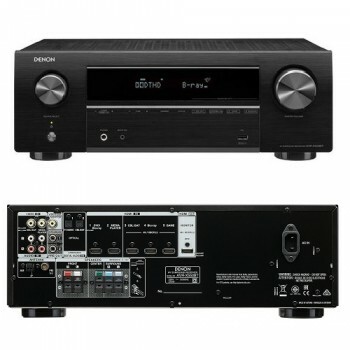 art of the Denon X-Series lineup, the AVR-X250BT AV receiver powers quality home theater at 130W per channel. Enjoy your favorite movies and shows with Full 4K Ultra HD, Dolby TrueHD and DTS-HD on all five HDMI inputs, and HDCP 2.2 support on three inputs. The 5.1 channel AVR-X250BT features Bluetooth for wireless music streaming from any compatible device and remembers up to eight paired devices so that family and friends can listen to their favorite tracks too. The guided Setup Assistant makes getting started a breeze. Plus, the Denon legacy of audio authority ensures you enjoy the latest technology and highest quality with every listening experience. Your favorite tracks, at your fingertips. Stream music from your computer or smart devices with the AVR-X250BT and built-in Bluetooth. It remembers up to eight paired Bluetooth devices, so invite family and friends to share their music and enjoy the audio quality of the AVR-X250BT. To stream via Bluetooth, simply select the Denon AVR-X550BT from the Bluetooth menu on your smart device.